What is tomosynthesis? Tomosynthesis is a method of imaging the breast in three dimensions displaying several angles in one single study. Why is tomo so important? With two-dimensional imaging, superimposed tissues can hide pathologies (masses, calcifications, cancers), as well as mimic breast pathology. When pathologies are mimicked, this creates unnecessary concerns. With 3-dimensional imaging, unnecessary patient recalls can be reduced by as much as 41%. The detail and the clarity of the images are also increased immensely. Medical Imaging today is as varied and as breathtaking as the new technologies that drive it. In the past twenty years, medical science has developed methods of viewing and measuring structures in the body that simply have evaded detection until now. We can also examine in detail internal organs that previously would have required a physician to surgically expose those same organs. Bear Lake Memorial Hospital produces state-of-the-art imaging, with incomparably high-quality studies and virtually immediate turn-around. Whether the exam is performed on MRI, CT, Ultrasound, Fluoroscopy, or Radiography, the patient and physician can count on fast and accurate results. Our technology offers the touchstone in imaging. But it isn’t just technology that defines the best studies. The machine is only as good as the technologist running it. At BLMH, we are extremely proud of our medical professionals who treat each patient as more than just an exam. They understand that each patient is intimately involved in his or her own life, a life being interrupted by a medical problem. Our people also know that the patient’s optimal recovery rests in the intently applied skills of the technologist to produce the best possible study. It’s that personal concern for each patient that sets Bear Lake Memorial Imaging Department apart from others. Nuclear Medicine is scheduled for Wednesdays. reconstructing 80 unique slices per gantry rotation, delivering high-quality images. Using new reconstruction technology, the new CT allows exams to be performed and reconstructed more quickly with reduced doses. Radiation Monitoring Enabling dose notifications for every patient and every procedure, the new CT has dose check software that alerts users if dose limits are exceeded. 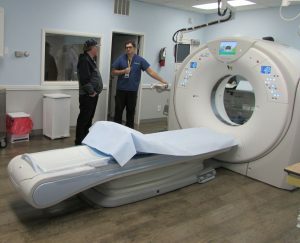 In addition to shorter exams that enhance patient comfort and convenience, the features a unique couch and gantry that also encourage patient compliance for higher quality images. • The industry’s widest couch of 47 cm creates a comfortable experience for patients. • The widest of any high-end CT system, a 78 cm gantry facilitates scanning for hard-to-scan patients and improves access for interventional procedures. Ultra high-frequency sound waves can explore the inner workings of the body, and that is what Ultrasounds do. Sound waves are channeled into the body and reflect back from various types and densities of tissue. Those reflections then create images of tissues at different levels. Ultrasonographers, as the techs are called, can assess specific organs and blood vessels for any abnormalities. The final diagnostic evaluation, of course, is performed by a radiologist. In the case of obstetric ultrasound, they are not only looking for abnormalities but also at the developing fetus inside mom. Ultrasound is, for the most part, noninvasive and quite comfortable. It also does not use ionizing radiation as x-ray does, and is considered very safe. Radiography simply refers to any use of x-rays. X-Rays have been used clinically since the 1920s to look within the body, usually at bone problems. Today’s x-ray units are far more sensitive and use far less radiation. While still used to assess bone abnormalities or injuries, x-rays also can render detailed images of connective tissue like tendons, ligaments, cartilage, and muscle, as well as some internal organs. Bear Lake Memorial uses all digital equipment. This makes it faster for the image and for your reading by our Radiologist. Fluoroscopy uses x-rays also and can display internal exams in real-time. If a doctor has to insert a needle for a biopsy or to deliver medication to a specific spot in the body, they will often employ fluoroscopy to see exactly where the needle is going. For certain types of intestinal tract studies, patients may be required to swallow an opaque contrast agent so the doctor can follow the agent through the patient’s body.